Everybody Uses Their Phone While Driving. A Proposed Law Wants to Change That in Colorado. Susan Dane of CORD held up a funeral program of two friends killed by a distracted driver. "I've never been to a funeral with two caskets, with the husband and the wife." Photo: Andy Bosselman, Streetsblog. Yesterday, members of the Colorado Senate Transportation Committee decided to continue negotiating changes to SB19-012, a bill that would ban holding an electronic device while driving. But first, they heard from a few opponents of the bill and more than 25 supporters, including many who told stories of how distracted driving crashes crippled or killed people they love. “This was not an accident that killed my friends, it was a preventable incident,” said Susan Dane who supports the bill. She and several friends from a motorcycle club founded the advocacy group CORD after a driver reading a text message swerved across a double yellow line and caused the 2016 head-on collision that instantly killed their friends, Brian and Jacquie Lehner. In the last decade, as smartphones became popular, traffic fatalities have increased at an alarming rate, both across the nation and in Colorado, with many linked to mobile phones. Colorado law already bans texting, and people under 18 are not allowed to use a portable electronic device while driving. The new bill would go further by making it illegal for anyone to hold a mobile device while driving. But it’s not an outright ban: Hands-free use could continue, including functions like turn-by-turn driving directions, playing music or talking on the phone. The proposed law is similar to those that exist already in 16 states, and legislators in 17 other states are considering comparable bills now. Denise Maes from the ACLU of Colorado opposes the legislation. Photo: Andy Bosselman, Streetsblog. 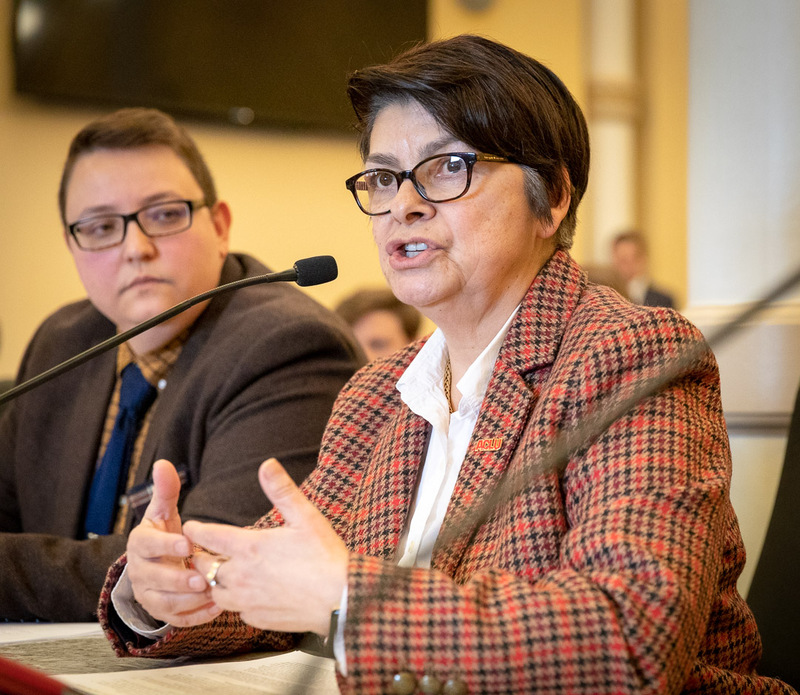 At the hearing, opponents of the bill admitted that distracted driving is a problem, but they argued that this legislation is not the right solution. However, most of the people who addressed the committee favor the law. 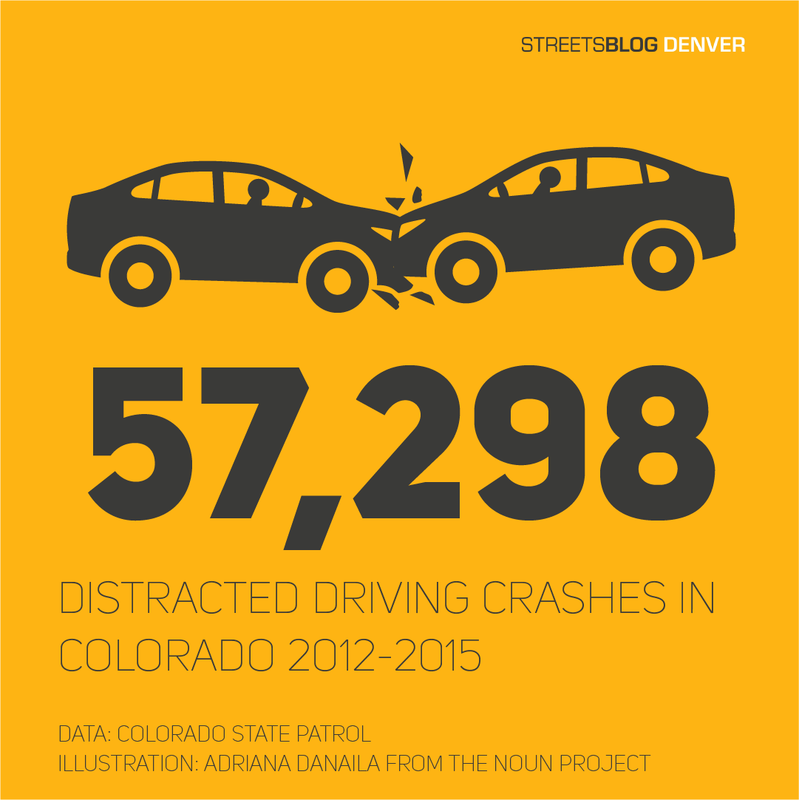 Distracted drivers caused 57,298 crashes in Colorado between 2012 and 2015, roughly 40 per day, according to an estimate from the Colorado State Patrol. The troopers say that distracted driving caused 67 deaths across the state in 2016. Nationally, 3,450 people died in these kinds of crashes during the same period, according to the National Highway Traffic Safety Administration. But government statistics underestimate the problem. “According to NHTSA, six percent of drivers were observed using a handheld phone or texting in 2015,” says a report from Zendrive. The company makes software that electronically monitored the driving of 4.5 million people. 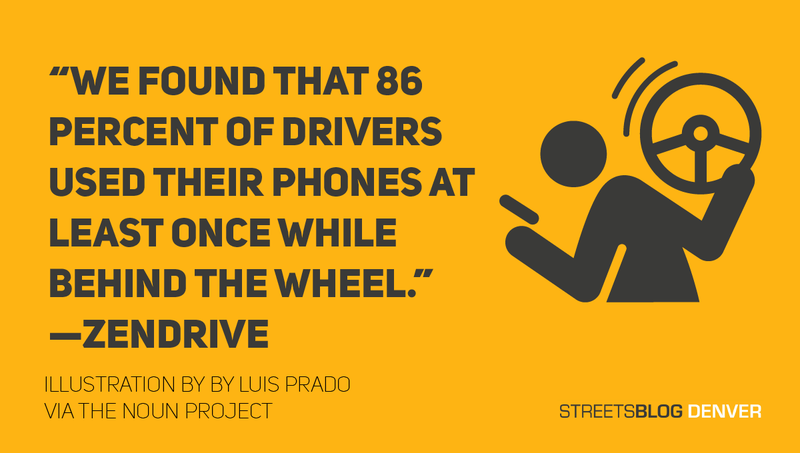 Their study showed that nearly everyone uses their phones while driving. 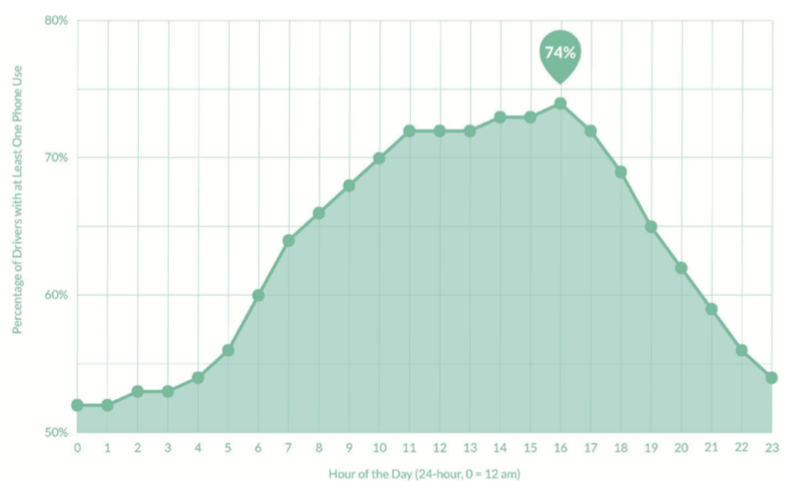 More than 70 percent of drivers use their phones while driving between 10 a.m. and 5 p.m. according to a study by Zendrive. Several who testified in support of the bill talked about how people can’t resist checking their devices, even while driving at highway speeds. Smartphones deliver dopamine hits, said McKinley. The beeps, vibrations and red-dot notifications coming from mobile devices are known to trigger the release the addictive neurotransmitter. The three who opposed the bill raised concerns about how the law might affect poor and marginalized people. It could increase racial profiling, and the consequences proposed are steep, they said. Drivers caught violating the law for the first time would face a $300 fine, four points on their driver’s license, and a class-two misdemeanor charge. Advocates countered that similar consequences are already in place to punish people who drive without insurance, and this potentially lifesaving law is even more critical. Crooked cops can use plenty of other laws on the books to harass minorities, they added. And unlike many laws that result in a disproportionate number of minority arrests, of the 3,202 people charged under Colorado’s existing texting while driving law, 88 percent were white, according to the State Patrol. Similar laws appear to be working in other states. In Rhode Island and Oregon, distracted driving went down 19 percent in the month after the regulations took effect, according to TrueMotion, a company similar to Zendrive. In Georgia, drivers texted and used apps 22 percent less in the months after their law went into effect. Traffic fatalities there also declined 14 percent, according to reporting by Bloomberg. Colorado legislators killed a similar bill last year. Yesterday the state Senate Transportation Committee held the bill while its members negotiate changes. The committee will schedule another hearing later in the legislative session — and Susan Dane will be there. Simple question: why did this take so long? Nobody despises more when either the left or right tries to legislate people’s morals and behavior but in this case “Emergency” is totally appropriate whereas a dumb wall as a monument along the border is inappropriate. IF the ACLU feels this is bad because of the misdemeanor stance, then they should support it being a felony. Disagree. They should be empowered to revoke the person’s driver’s license and seize the car, not the phone. The phone isn’t what is doing the killing. Take ’em both, use Visegrips on the phone and a wrecking yard crusher on the car. from Colorado Department of Transportation, 2018). task is trying to drive at the same time. One potential solution to the growing trend of fatalities on our Colorado roadways could be for Colorado state law makers to consider implementing the hands-free law that is already in effect in sixteen other states. These sixteen other states have seen distracted driving deaths decrease by half. The fact of the matter is that research proves the use of a cell phone, texting and or talking increases the risk “8 times more likely to crash or have a near miss when dialing a phone” (Retrieved from The National Institute of Health,2014). united states, 1999 to 2008. American Journal of Public Health, 2213-2219.